In an effort to understand the positions of both sides, I have created a dialogue between two imaginary characters, both Catalan. Gemma is for independence, and Toni is against. I’m not recreating the most commonly heard arguments for and against independence, but rather what I regard as the most plausible arguments on both sides. I hope that this exercise helps some readers understand the key arguments, but I also look at this as a learning opportunity for me as the author. What have I left out or gotten wrong? Who is more persuasive? GEMMA: Surely, Toni, you concede that the people of Catalonia have a right to decide their own political future. Eighty percent of us wanted a binding referendum on independence, and that is what the Parliament has tried to give us. TONI: I am not opposed to a binding referendum on independence, but then there is the little matter of the Spanish Constitution, which declares the country “indivisible.” Puigdemont’s referendum was illegal, and its results are of no validity. GEMMA: Fighting the Nazis was also “illegal” in Germany. An unjust law is no law at all. TONI: Germany was not a democracy in the 1930s. Spain is. GEMMA: The U.S. was a democracy in the 1950s, but it discriminated against African-Americans. The civil rights movement’s sit-ins and protests were often illegal, but weren’t they morally justifiable? TONI: I agree. But Catalans are not discriminated against today in the way that African-Americans were. GEMMA: I don’t claim that we are. But we still have a right to decide our political future, and it is wrong for Spain to deny us that, constitution or no. TONI: The right to self-determination is not an individual right like freedom of expression or the right to vote; it’s a collective right and therefore subject to far stricter limits. Your right to secede infringes on the rights of others who do not want secession. Like me. GEMMA: That’s the reason why we have to be guided by the opinion of the majority. If we must force some people to go along against their will, it’s better to force the few than the many. TONI: But do the majority of Catalans want independence? I deny they do. GEMMA: We’ll talk about that later. Let’s focus on the question at hand: if the majority of Catalans do want independence, is it not morally acceptable for them to claim it? TONI: Making such a big change on the basis of 50% plus one votes is a dubious proposition at best. And this is not the best of circumstances, in fact. Declaring independence now means breaking Spanish law and inviting economic and political disorder. Even when you have justice on your side, it is prudent and wise to exercise your rights in a careful and cautious fashion. That is not what the Catalan Government is doing. GEMMA: I don’t understand why the status quo should be privileged here. If a majority of the voters clearly express their will to gain independence, forcing them to go along with the minority causes more disorder and more injustice than moving forward with independence. And the economic and political disorder is the fault of Spain, not the Catalan Government. TONI: Now it’s you who are straying from the topic. Look, I don’t think we are all that far apart here. I favor a right to decide, although I would prefer a threshold like 52.5% or 55% for independence, not 50% plus one. I might even be willing to concede that denying the right to decide is unjust, but I nevertheless maintain that it is a small, almost trivial injustice. Furthermore, you deny the right to self-determination to your own minorities. GEMMA: The Catalan Government has recognized the right of the Aranese to independence or rejoining Spain. Our treatment of minorities within Catalonia is exemplary. TONI: But what about L’Hospitalet de Llobregat? A large majority of people there oppose independence. Should they not have the right to rejoin Spain? GEMMA: Perhaps, eventually. But look, the Catalan Government envisions allowing dual Spanish-Catalan citizenship after independence. So no one is going to be forced to give up Spanish citizenship and all its rights and privileges. TONI: You’ll still have to pay taxes to the Catalan state. GEMMA: As we do now to the Spanish one. It doesn’t make sense to strain at gnats and swallow camels here: Catalonia is indisputably more liberal toward its national minorities than Spain is. TONI: The point is that if a majority of Catalans support independence (which I deny), it’s an extremely small and tenuous majority, and even if there is a right to decide on independence, it can be unwise and imprudent to stand upon your rights. GEMMA: As for the wisdom and prudence of the independence declaration, we can discuss that later. But since we don’t disagree very much on the right to decide, let’s get to the real issue: whether Catalonia ought to become independent or not. TONI: Catalonia is currently one of the most autonomous regions in Europe. Spain is an advanced democracy. Catalan is widely and freely spoken within the region. Our economy is prosperous. Why should we ruin a good thing by chaotically leaving Spain? GEMMA: Because Spain is not really a free country, and Catalonia doesn’t really enjoy the autonomy you say we do. Look at the Regional Authority Index: Catalonia enjoys a lower self-rule score than the Canadian provinces, the Swiss cantons, the Faroe Islands, Greenland, Aland, U.S. states, Republika Srpska, Mount Athos, Australian states, Canadian territories, German Laender, Italian regions, the Azores, Madeira, Navarre, Puerto Rico, District of Columbia, Sarawak, Sabah, and the states of Mexico. TONI: But it still enjoys a higher self-rule score than French regions and on par with the Austrian Laender, Belgian regions, Argentine provinces, and Brazilian states — those four are federal countries! GEMMA: But even the autonomy we do have is a sham, because the Constitutional Court is controlled by the central government. The World Economic Forum survey shows Spain has less judicial independence than China, Tajikistan, Azerbaijan, and Kenya, never mind other European states. It’s no surprise then that the courts always rule against Catalan autonomy. We can’t have true self-government if the Spanish state can always reinterpret it according to its own desires. TONI: Judicial reform is a great idea. Why don’t we work toward that rather than independence? You could build a broad coalition across Spain for that reform. 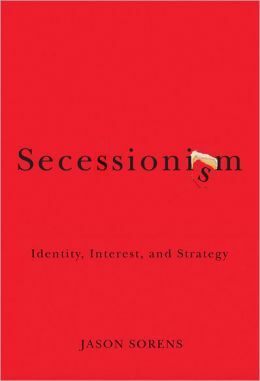 The problem with secession is that it avoids problems rather than confronting them. If Catalonia actually does become independent, it will make constitutional reform in Spain even more difficult. GEMMA: Isn’t that like defending immigration restrictions on the grounds of preventing “brain drain”? GEMMA: If it’s wrong to force doctors and engineers to live in poor, authoritarian countries because we want them to do good there, isn’t it also wrong to force me to continue to be a Spanish subject just so that I can be a vote for constitutional reform? TONI: Who’s talking about forcing? This is a total red herring. I support your right to decide, but I deny you ought to decide in favor of independence. The costs outweigh the benefits, and one of those costs will be a less free Spain. GEMMA: Independence might actually teach Spain a lesson and cause them to become freer in future. GEMMA: No, seriously. You can’t defend the behavior of the Spanish state in Catalonia recently, can you? TONI: No, but the five people who went to the hospital after the police charges hardly constitute a wave of authoritarian repression. GEMMA: What about the “Jordis” held in prison without bail? What about the websites shut down? What about the cyber attacks against the Catalan Government? What about the newspapers ordered not to print referendum notices? Don’t these acts violate the Spanish Constitution just as much as the Catalan Government’s acts? TONI: They acted foolishly; they should have let the referendum go ahead and then just refused to recognize its legitimacy. I don’t defending holding Cuixart and Sanchez without bail, but it’s appropriate to investigate them for organizing a demonstration that trapped police in a building while they were merely performing their duties. TONI: I put them more or less on the same level, although I will note that most of the orders against websites and so on came from judges, not ministers. Presumably they know the law better than you or I.
GEMMA: Now we’re back to the problem of the judiciary in Spain. TONI: Look, the bottom line here is that I believe Spain is reformable and you do not. GEMMA: I have good reason to think Spain is unreformable. There are hostile, implacable majorities to Catalan self-government in the rest of Spain. The vast majority of Spanish voters oppose reforming the constitution to allow a binding referendum on self-determination or to create a federation. There is no political path forward here. TONI: Okay, but maybe they would do well enough to form a coalition with the Socialists and, say, the PNV, and get the process started. TONI: It could happen, but only if we stay in Spain and make the case. Persuasion is the way to go, not just leaving. Once you leave, you can’t go back. GEMMA: Actually, we could. Independent states have joined together before. Look at how the German states came together to form Germany in the 19th century, or the American colonies joining together in the 18th. TONI: It won’t happen here. There is so much bad blood now because of this independence process that Spain and Catalonia will be adversaries for years to come. And that’s bad news for us, because we need their support to get into the EU. GEMMA: That bad blood isn’t our fault. If it weren’t for the independence process, the same Spanish mentalities that have brought about this campaign of repression would have hurt us in the future for one reason or another. If Spain wants to keep us by force, what does that say about their intentions toward us? TONI: It says nothing about their intentions, but about their conception of the Spanish nationality. GEMMA: If you had a girlfriend who told you that she would beat you violently if you ever tried to leave her, wouldn’t that make you want to leave her more? TONI: Bad analogy. Spain and Catalonia are groups of people, not individuals. GEMMA: But the basic point carries through: if Spain is willing to use force to stop us from self-determination, they want to have the power to exploit and abuse us. TONI: Stop collectivizing “Spain.” Plenty of Spanish people do not want to use force against us. TONI: Now we’re arguing in circles. Let’s move on to the economic problems of an independent Catalonia. GEMMA: What you call “problems” I call opportunities. Right now Catalonia pays about 8% of its GDP every year to the rest of Spain. Despite being the economic powerhouse of the country, public spending per person is actually lower in Catalonia than the rest of Spain. That’s fiscal exploitation, and we will get an immediate economic boost from independence. TONI: I say that figure is closer to 5% of GDP than 8%, but whatever. I don’t deny that there are selfish reasons behind independence, but I’m against selfishness as a political agenda. It’s our duty as a well-off region of Spain to help the less well-off parts of the country. GEMMA: It’s not selfishness, it’s basic fairness. We work harder and pay higher prices for things, but we don’t get to reap the rewards. TONI: I agree that the regional fiscal formula should take cost of living into account, and we would get some more public funds if that were the case. I even think Spain ought to give the autonomous communities more taxing powers. But you can do that without independence; look at the Basque Country and Navarre as possible models for Catalonia (“Concierto”). GEMMA: But how do we get the Spanish Government to agree to a Concierto for Catalonia? TONI: I don’t know, but certainly not by violating the Constitution and declaring independence. GEMMA: The issue of how to negotiate with Spain is really separate. All I want you to concede here is that if Catalonia became independent, all else equal, our economy would be healthier – right? TONI: Are you assuming Catalonia stays in the European Union? Because that’s far from guaranteed. GEMMA: I said “all else equal,” so yes. TONI: Well, by that definition I would have to concede it. But I don’t think we should just care about the economy of Catalonia; I care about the fate of our fellow Spaniards. GEMMA: So do I, but that doesn’t mean I must be in political union with them. If fairness requires that Catalonia give 8 or 5% of its GDP to Spain every year, doesn’t it also require that Spain give 5 or 8% of its GDP to Morocco? In fact, if this is an argument against Catalan independence, isn’t it also an argument against Spanish independence? Shouldn’t Spain politically unify with Morocco? Then it could help the citizens of Morocco quite a lot. TONI: I’m not sure Morocco would like that. Too many Spaniards; it would be colonialism all over again. GEMMA: Well, India then! Indians could well and truly outvote Spaniards. Spain could be an Indian colony. That’s only fair, by your logic, isn’t it? TONI: The question of foreign aid is a difficult one. We should be giving foreign aid to India, but that doesn’t mean we need to be politically unified with them. GEMMA: Then Catalonia can give aid to Spain without being politically unified with it. TONI: Of course. I’m just pointing out that if some aid is to continue after independence, the economic case for independence is less than it seems at first sight. GEMMA: Fair enough. But there is still a substantial case for it, especially when you take into account the opportunity to get away from Spain’s corruption and wasteful public spending on Pharaonic projects. TONI: Catalonia is not much less corrupt than the rest of Spain. Just look at the corruption in the old Convergence and Unity party. How many of the politicians in today’s (pro-independence) Democratic Party of Catalonia were involved in corrupt contracting practices? GEMMA: As far as you or I know, no one. You can’t seriously dispute that Catalonia is less corrupt than Spain. TONI: It’s a very near thing as far as I can see. And Catalonia has plenty of wasteful public spending too. We have one of the highest debt-to-GDP ratios among all autonomous communities. GEMMA: The reason for that was the incentives set up by the old system. With the central government footing the bills, all the autonomous communities spent wastefully. Independence offers us an opportunity to get away from the old way of doing things. TONI: Even if that’s true, it shows that there is nothing inherently virtuous about the Catalan political system or the nationalist parties currently running the government. Let’s talk about something much bigger than these considerations: the European Union and World Trade Organization. Independentists have tried to mislead us for years about the prospects for Catalonia’s joining the EU. Accession would not be automatic, and Spain will never allow it. Being outside the WTO will be even worse. Catalonia is a small, trade-dependent economy. The tariffs our goods will face will crush our export industries. These effects alone could be larger than the 8% of GDP you say our net fiscal transfers to Spain represent. GEMMA: No one denies there will be short-run costs to independence. The long-run benefits are larger. If Spain is willing to harm Catalans by keeping us outside the EU after independence, they will also be willing to harm us when we are under their thumb. At least independence lets us negotiate with other European countries as an equal. WTO membership will happen relatively quickly. Also note that as long as other countries do not recognize Catalonia’s independence, our goods will have access to European and global markets on the same terms as Spanish goods. There is no reason recognition of our independence and accession to the WTO and EU could not happen around the same time. TONI: It’s odd, you have to admit, for independentists to hope that Catalonia’s independence is denied recognition so that Catalonia’s citizens are still treated as if they were Spanish citizens. If Catalonia is denied recognition, other European countries are not going to negotiate with Catalonia as an equal. You cannot have it both ways: all the rights and benefits of independence but none of the duties and costs. The short-term costs of secession could be huge. Just look at all the businesses moving out of Catalonia. GEMMA: Those businesses are just moving their headquarters, not their actual operations. It’s for legal reasons, such as access to European Central Bank bailouts. TONI: Actually, some executives of companies are moving too, and statistics I’ve seen show tourism to Barcelona is down. GEMMA: Over the long run, tourism will rise because Catalonia’s profile will rise as a destination when we’re an independent state. GEMMA: Independence is only risky and costly because the Spanish Government is making it so. If they were willing to negotiate, independence could be seamless and efficient, like Czechoslovakia’s Velvet Divorce. TONI: But they’re not, and we have to deal with reality as it is. GEMMA: The more Spain punishes Catalonia for the independence process, the more desirable independence becomes, because the more obvious it becomes that Spain is willing to harm Catalans for its own political purposes. The choice is between being ignored, exploited, and trampled forever or suffering those costs all at once for a chance at living free and prosperous forever. TONI: Even if you support independence, which I do not, you cannot endorse the manner in which it is being pursued. What ever happened to common sense and good judgment? A unilateral declaration of independence is a terrible idea. We Catalans are about to lose everything we have worked for since the 1978 transition, including the self-government we currently have. Spain may even ban independentist parties. GEMMA: What was the alternative? Simply submitting and accepting punishment and humiliation? Spain was imposing direct rule even before Puigdemont called the session to declare independence. TONI: It should never have gotten this far. After October 1, Puigdemont should have called off the process, because the referendum was not held in free and fair conditions. It gave no mandate for independence even if you take the result at face value. GEMMA: Whose fault was that? Not the Catalan Government’s. They had everything in place for a regular, legal vote, until the police intervention. TONI: Even without the police intervention, many Catalan voters would have boycotted. GEMMA: Still not the Catalan Government’s fault. Should we be held hostage to a boycotting minority? That’s not how democracy works. TONI: They’re not the minority. May I remind you that only 42-43% of the eligible electorate voted on October 1. And on November 9, 2014, only 37% voted. Neither vote can be considered representative. Every poll by the Center for Opinion Studies since July 2016 has shown more Catalans opposed to independence than in favor. And in the “plebiscitary elections” of September 27, 2015, independentists won only 47% of the vote. The declaration of independence is undemocratic and illegitimate. GEMMA: I’ll take your points one by one. First, the police violence of October 1 undoubtedly suppressed turnout, and the 9N2014 consultation was nonbinding, which also depressed turnout. Let’s assume that an agreed referendum could have gotten 75% turnout on October 1, a huge number. Even if every single one of those additional voters voted no, the pro-independence vote would still outnumber the anti-independence vote. And support for independence has only grown since the police violence of that day. Polls are volatile and often biased. Elections are the only way to secure democratic legitimacy. In the 2015 election, support for independentists outnumbered support for unionists. The balance was provided by parties with no position on the issue, like the Pirate Party and Catalonia Yes We Can. TONI: And Catalonia Yes We Can opposes the declaration of independence. I would wager that most of their voters oppose independence. So the implications of the 2015 election are not as clear as you think they are. Even if a majority of Catalans support independence right now, that could easily change. Such a slender, ephemeral majority is hardly the basis for such an important step. GEMMA: What choice does the Catalan Government have? They have tried everything to gauge the will of the Catalan people. After the massive independence demonstrations of 2011, they held an election on a platform of beginning the self-determination process. The pro-sovereignty parties won the 2012 election with 50% of the vote. They repeatedly tried to negotiate a referendum with Spain, which is not banned by the Constitution. Rajoy repeatedly rejected those overtures. Then they tried to do their own referendum, which because of court rulings was downgraded to an informal consultation run by volunteers. Independence won that vote. No one forced anti-independence voters to boycott. Then the plebiscitary elections were held. Independence won again. Finally, the October 1 binding referendum confirmed that result. Every time independence has been tested at election, it has won. If opponents of independence want to stop the process, all they have to do is win one, single, solitary Catalan election. That they cannot do. Now exercising our right of self-determination cannot be conditional on a thug’s veto, that is, Spain’s violent disruption. TONI: We anti-independence voters boycott these fake referendums because they are illegal. It is pointless to participate in them. If Puigdemont were so sure of a pro-independence majority today, why didn’t he call elections? GEMMA: Because the process has been going on for more than five years now. It is time to bring it to a conclusion. TONI: You have to deal with the world as it is, not as you wish it to be. Even Andreu Mas-Colell says Catalonia cannot have real independence right now. There is no question of having territorial control. Spain will intervene and crush the independence movement, rule Catalonia directly, and call new elections. Independentist parties will either boycott these elections or be banned, and unionists will govern Catalonia. Catalan public media, schools, and police will be purged of independence supporters. The Catalan immersion program in our schools will be abolished in favor of Castilianization. This is all a disaster from your perspective as well as mine. Is all this theater of independence declarations and singing “Els Segadors” in the streets really worth that political reality? GEMMA: The fact that the Catalan Government does not have territorial control does not mean that the Spanish Government does. We saw that on October 1 they could not stop the referendum from happening. The people will be in the streets to defend our sovereignty. The world will not allow Spain to kill us all, and that is the only way they could actually rule directly. TONI: I shudder at the coldness with which you contemplate such extremes. GEMMA: Not coldness at all. I am merely plotting out the game tree. At the end of the day, Spain’s capabilities may be higher than Catalonia’s, but Catalonia’s resolve is much higher than Spain’s. I don’t think any of the “extremes” you mention will actually come to pass. TONI: And if your independence adventure turns out to be catastrophe, there will be no turning back, no way to undo the damage. GEMMA: To the contrary. There is a constituent process for a new constitution. Spain should allow it to continue. Unionists could win those elections and write a constitution defining a political link with Spain. This negotiation might even allow a way to unblock the constitutional reform problem. Bilateral negotiations between Catalan and Spanish states could come up with a new institutional arrangement without the need for a constitutional amendment. TONI: Now you are really lost to high speculation. I have never heard any independentist minister or politician discuss such a scenario. Every historical precedent suggests that once a country attains independence, it doesn’t go back. That said, I don’t expect it to get that far. Spain is fully capable of taking total control of Catalonia, regardless of how many of your friends go into the streets. GEMMA: We shall have to see, won’t we? GEMMA: Don’t be so glum, Toni. It’s a beautiful moment. There were a lot of loyalists in the American colonies when they declared independence, and Britain was much more powerful, but look what happened there. TONI: Are you counting on French intervention too? GEMMA: Slovenian? Belgian? Estonian? Once a few EU countries recognize us, the EU as a whole will have to get involved. TONI: As you said, we shall have to see. Last year, I offered a bet that if an election were held this year in Catalonia, Catalan independentist parties would win a majority of valid, nonblank votes. One was, and they didn’t. The only person to take me up on the bet was Bernat Gispert, who bet me dinner next time I’m in Barcelona, hoping that he would lose. Alas, I owe him dinner now! Why didn’t independentists win? Shortly after I offered that bet, in November 2014, support for independence declined precipitously, with a June 2015 survey from respected outfit CEO putting opposition to independence at 50-43%. I explored some reasons for that decline in another post, even as I predicted a rise in support before the September 27 election (I was right about that!). In the rest of this post, I will explore the results from Sunday’s election in greater depth and what they imply about the views of the median voter in Catalonia. Here are the party results in votes and seats. The two independentist lists, JxS and CUP, between them won a majority of seats but only 48.0% of the valid, nonblank votes. The UDC is a Catalanist party that used to be in a longterm alliance with one of the constituent elements of the JxS list, leaving this year over the issue of independence. Their leaders have favored confederacy or freely associated state status for Catalonia, which international lawyers generally consider a form of independence. However, they opposed JxS’s roadmap to independence because it involved an illegal declaration of independence. Their campaign focused on “the power of good judgment (seny)” and was aimed at voters who might be pro-independence but are above all pro-stability and pro-business. The leader of the list has said that the UDC’s votes cannot be considered votes either for “yes” or for “no” to independence. Catalonia Yes We Can, a radical-left list, supports a referendum on independence but is internally divided on whether Catalonia should actually become independent. The leader of their list has likewise said that their votes cannot be considered either “yes” or “no” on the issue. 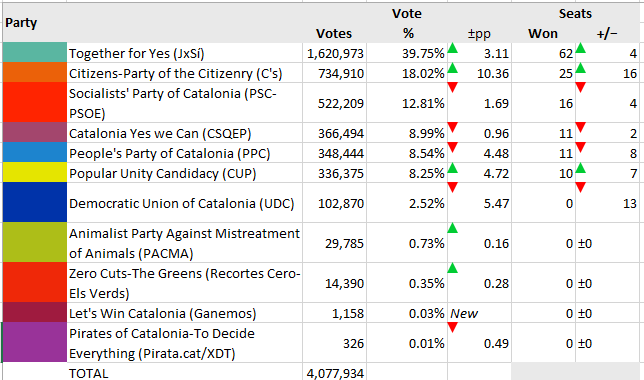 Therefore, independentists are claiming that when one adds together the votes for the two independentist lists (JxS+CUP), they exceed the votes for the anti-independence lists (PSC+PPC+C’s), 48.0%-39.4%. JxS supporters, in particular, are claiming a mandate for the roadmap to independence. To their credit, the radical-left party CUP says that this is not enough for a unilateral declaration of independence. Because their seats are essential to an independentist coalition, CUP will likely be able to negotiate with JxS some amendments to the roadmap. One of those amendments is likely to be a definitive referendum, in which the Catalonian government agrees to respect whatever outcome the majority decides, declaring independence if a majority votes “yes” and shutting down the secessionist process for a generation if the majority votes “no.” Of course, Spain says such a referendum is illegal and will try to stop it by imprisoning officials, etc. It’s not clear that they’ll be able to prevent it from happening, however. Nor is it clear that the hardline unionists will boycott this vote as they did the 9-N consultation, if they know a declaration of independence will immediately follow a “yes” victory. Do the majority of Catalans support independence? It’s impossible to be certain. Suppose half of the minor parties’ (PACMA, RC-EV, Ganemos, Pirata) electorates support independence. That adds 0.6% to the independentist total. Then add a mere 20% of the votes won by the anti-roadmap but pro-right-to-decide UDC and CSQEP. That adds another 2.3%. That extra 2.9% would give independence an extremely slender 50.9-49.1% majority. I don’t think it is plausible to think that fully half of CSQEP and UDC voters support independence. A final issue is that of votes from Catalans abroad. The Spanish government was responsible for sending them ballots, but apparently the vast majority did not receive them. Catalans abroad are overwhelmingly pro-independence. The returns from international ballots for the Barcelona province allegedly show more than 65% voting for the independentist lists. Turnout from Catalans abroad was a mere 7%, so clearly there was some kind of snafu. The voting period for Catalans abroad has been extended to Friday, but it’s not clear this will resolve the problem for most. How would 70% participation among the 200,000 Catalans living abroad affect the result of the election? (This is just below the 77% turnout overall for this election.) If we add 0.7*200000*0.65=91,000 votes to the independentist lists and 0.7*200000*.35=49,000 votes to the other lists, the independentists still end up with just 48.56% of valid, nonblank votes. As a political scientist, I don’t believe in “mandates.” Electoral choices revolve around many different issues, differential turnout can affect results, voters are often ignorant of party platforms and how policies affect outcomes, and cyclical majorities and different preference intensities complicate any attempt to come up with a “will of the people” under the best of circumstances. Yet if Catalonia’s election tells us anything about the position of the median voter on independence, it is probably this: the median voter may well support independence, but not a roadmap that includes a unilateral declaration of independence (at least not yet). The new government of Catalonia, whenever it forms, would do well to proceed with caution. On September 27, Catalonia, an “autonomous community” of Spain, votes in a regional election that will likely determine whether the region declares independence from Spain. The Economist and other global news outlets have generally not taken the movement very seriously, which is a grave mistake. According to a series of new polls, the independentists are likely to win this election, and if they do win, they will pursue a roadmap ending in a proclamation of independence within 18 months. It would be the first secession from an industrialized democracy since either Iceland (1944) or Ireland (1922), depending on how you count (Iceland had full internal self-government from 1918). Catalan independence may well be a good outcome for the world. There are several reasons why Catalonia is likely to be more successful as an independent state than Scotland would have been. First, Catalonia is significantly wealthier than the rest of the Spain and suffers a significant annual net fiscal drain to the Spanish treasury, on the order of 6-10% of GDP. Catalonia is also the least corrupt region of Spain. The stock markets also suggest that independence might benefit or at least not hurt Catalonia. I examined the INDEXCAT produced by the Barcelona stock exchange, an index of all Catalan-owned, publicly traded companies on its exchange, to see how its prices responded to changes in the probability of independence. Since September 11, 2012, when the independence movement reached a popular crescendo on the streets, the INDEXCAT has grown 48.7%, compared to 26.2% for the IBEX 35 index of major Spanish firms, to 31% for the German DAX, to 24.4% for the Dow, and 21.6% for the EUROSTOXX index. This chart produced by the Catalan Business Circle shows that the fastest growth for the INDEXCAT occurred during the period when independence seemed most likely to occur, the late 2012 to late 2013 period when support for independence generally topped 55% of those expressing an opinion in yes-no questions and it still seemed possible a true referendum might be held. Then I looked at how the INDEXCAT responded to the recent turnaround in polling for the September 27 elections. After several months of declining support for independence and independentist parties, public opinion started to turn around dramatically just two weeks ago. (Right after I predicted it would!) There have been three “polling shocks” since September 1. (The English-language Wikipedia article on these polls is rapidly and accurately updated.) The first and most significant occurred on the night of September 3, when three polls were released, all showing a pro-independence majority, after a series of July and August polls showing the independentist lists well short. We should expect investors to update their views about the likelihood of independence immediately and to trade on those views as soon as possible. Within a few minutes, the new market prices should reflect the public information. 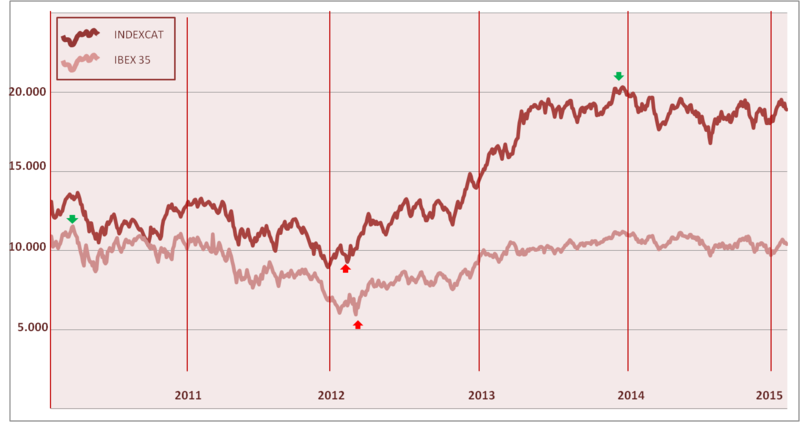 The INDEXCAT dropped just 0.31% between close on September 3 and five minutes after opening on September 4. That is consistent with a small negative impact of independence on major Catalan firms, but let’s look at the other shocks. On the morning of September 9, a modest negative polling shock occurred, as following a string of four polls showing a clear independentist seats majority, a poll from the respected Spanish government research outfit CIS showed the slenderest of possible majorities for the independentists, just 68 out of 135 seats. It’s hard to figure out exactly when that information went public. A single tweet with the results went out at 9:00 AM exactly, but it seems to have broken an embargo, and those results weren’t confirmed until 9:30. In any event, between 9:00 and 9:10 AM, the INDEXCAT fell 0.22% and didn’t change much over the following hour. These results are consistent with a small positive impact of independence on major Catalan firms. Finally, over last weekend a new series of polls seemingly have shown the CIS result to be an outlier, once again confirming a clear seats majority for independentists. Between market close on Friday and 9:05 AM Monday, INDEXCAT rose 0.26%. This outcome is consistent with a small positive impact of independence on major Catalan firms. Unfortunately, I cannot calculate the expected value of independence for publicly traded Catalan firms as I did for Scottish companies, because there are no betting markets on Catalan independence or the majority in the coming election. (Unbelievable but true.) Still, on balance, the results suggest that investors expect Catalan companies to become more, not less, profitable with independence. In turn, that finding implies that the transition costs of independence are excessively hyped. The second reason why I think Catalan independence may be good for the world is that the Spanish government has not given any concessions to Catalans to prevent them from voting for independence. To the contrary, Spain has tried to recentralize powers and has even hinted at using military force against Catalans (almost certainly a bluff). The contrast with Britain’s response to Scotland could not be stronger. If Catalans vote against independence, it would send a bad signal to Spain: that threats work to deter secessionism. Moreover, it would leave Catalonia and all the other autonomous communities vulnerable to even more severe recentralization policies. Unilateral disarmament more often invites aggression than defuses it. The final reason why Catalan independence would be good for the world is that Spain’s existing pattern of decentralization is dysfunctional, as just about everyone recognizes. Spain’s autonomous communities racked up excessive debt during the 2000s boom and have required bailouts from the central government (PDF). Those bailouts establish a moral-hazard incentive for autonomous communities to continue profligate spending and rely on the central government for assistance when borrowing becomes difficult. Why did the autonomous communities rack up excessive debt in the first place? Stanford political scientist Jonathan Rodden has shown that when there are no external balanced-budget requirements on lower-level governments in decentralized systems, the only way to encourage fiscal discipline is to require the lower-level governments to pay for their own spending mostly out of own-source revenues and to make credible promises to let these governments go bankrupt if they cannot pay back their bondholders. The bond markets then provide fiscal discipline: subcentral governments maintain fiscal discipline because if they borrow too much, they will end up paying higher interest rates. But what happened in Spain was that the autonomous communities (with the exception of Euskadi and Navarre) had vast spending rights and responsibilities but few sources of independent income. They depended on central government grants, and thus had little incentive to spend the money responsibly. So you got things like this. If Catalonia leaves Spain, it will be a significant fiscal shock to Spain. One relatively easy way for the Spanish central government to deal with the shock is to reduce transfers to the autonomous communities and allow them more independent taxation powers. The autonomous communities will complain about the burden-shifting, but the more nationalist communities will be happy to enjoy more fiscal autonomy. Moreover, fiscal competition between independent Catalonia and rump Spain could encourage both governments to adopt more efficient and less corrupt policies. Catalonia isn’t a free-market paradise. For instance, the regional government passed a protectionist law limiting shop hours that the Spanish government wisely overruled. Politics throughout the Mediterranean region are toxic right now, and Catalonia is not immune. The European Central Bank’s unconscionable policies of monetary austerity have kept southern Europe in economic crisis for years, and the region’s voters have turned against wealth creation and free markets as a result. That’s a different problem with different solutions. But in the medium term, would you rather see Catalonia as part of a Spain ruled by a coalition between the corrupt left (PSOE) and the extreme left (Podemos), since the PP will lose the next election, or would you rather see an independent Catalonia in which the largest party has always been of the center-right (Convergence)? Bryan Caplan argues that social conservatives should prefer libertines to hypocrites, contrary to the common meme that “at least hypocrites have moral standards.” The argument is pretty simple: hypocrites seem to share your values, but when you least expect it, they will betray you. So far as it goes, the argument is pretty convincing. But libertines and hypocrites aren’t the only two possible types of people who fail to live up to putative moral standards. A true hypocrite doesn’t actually have moral standards but merely pretends to them. After all, if one has moral standards, they should affect your behavior appreciably, but the hypocrite simply does what (s)he wants anyway while feigning belief in a stricter standard. That’s what makes hypocrites so dangerous. The third type of moral failure is weakness of will. The weak-willed believe in moral standards and generally live up to them, but occasionally fail due to weakness of will. The weak of will acknowledge their flaws and try to do better, but you know they will sometimes fail. Unlike the hypocrite, the weak-willed is open about his/her failings, and therefore when dealing with them you know better what you’re dealing with. 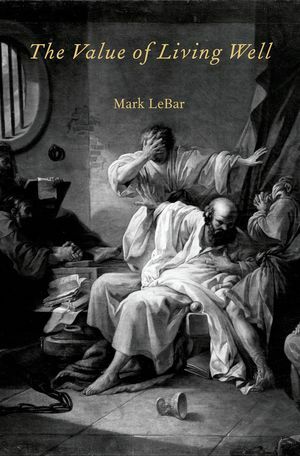 Unlike the libertine, the weak-willed often actually do live up to moral standards, so long as it isn’t too hard to do so. Therefore, social conservatives should rank moral failures thus: 1) weakness of will, 2) libertinism, 3) hypocrisy. What some social conservatives praise when they praise “hypocrisy” is probably actually weakness of will, if they took some time to reflect on the distinctions. I thought about these distinctions while considering the case of corrupt socialists. In the Spanish news today is the number-three man at Podemos, the extreme-left party in Spain (more or less their answer to Greece’s Syriza – the relations between the two parties are extremely close). This man, Juan Carlos Monedero, took half a million dollars from left-wing governments in Latin America (most particularly the Venezuelan dictatorship) for “consulting” and failed to pay taxes on it. He also defrauded his university, a technical college in Madrid, which was contractually guaranteed 20% of his consulting contracts. Does this fraud evince hypocrisy or weakness of will? After all, Podemos has taken the lead in denouncing corruption in other parties, whom they call “la casta.” Withholding taxes from the government has to be a cardinal sin for socialists. Can true-believing socialists excuse the act on the grounds that “at least he has principles”? Or is he really pretending at having socialist principles at all? It’s difficult to answer this question, because socialism attracts the unprincipled. If you want to enrich yourself through government, there’s no better way to do it than to denounce corruption and promote populist measures against the rich in order to get elected, and then once elected, use state-controlled companies to feather your own nest. When the state controls the economy, it controls wealth, and it will be extremely tempting to funnel some of that wealth to yourself and your friends. Not knowing more about the man, it’s difficult to know whether Monedero – and quite possibly the other leaders of Podemos – are hypocrites or merely weak-willed. But that fact alone shows one of the inherent problems of socialism: really existing socialism either brings about rule by the already corrupt or corrupts those who rule. That’s the title of a very good article by Princeton political scientist Carles Boix and J.C. Major. The article provides background to the Catalan self-determination movement but also discusses recent developments and the reasons for them. One takeaway is the enormous role that the Spanish government’s response to the last Catalan autonomy statute, essentially gutting it, played in provoking the growth of the independence movement. As I noted in a piece in Electoral Studies 10 years ago, when the central government spikes decentralization, secessionists strengthen, but when a referendum on independence or autonomy fails (the failure being internal rather than external in origin), secessionists weaken. The article also contains important information on what the Catalan government plans to do if the central government forbids it to hold a referendum, as seems likely. I won’t spoil it; just read the article. 4) Catalonia and Spain may both be more viable as separate states than together. Spain's political economy is dysfunctional. Catalonia’s would not be (the largest Catalan party is centrist with some classical liberal elements). A functional state can carry a larger debt burden than a dysfunctional one. Therefore, the European Union might pressure Spain to accept a post-referendum settlement by which Catalonia is allowed to go free while taking on a disproportionate share of Spain’s debt. (On this point I am indebted to Jaume Lopez Hernandez of the Universitat Pompeu Fabra.) This is the second most likely outcome. 5) Spain’s threat to arrest Catalan leaders and prevent secession by force is not credible. (Although some autonomists and secessionists in Spain insist that the central government would indeed send in the tanks.) Therefore, it is unlikely that the Catalan government will be deterred. A “yes” vote followed by suppression is the least likely outcome, even less likely than a “no” vote. 6) If the Catalan referendum is held, regardless of the result, it would set a powerful precedent for Basque nationalists. The precedent is not that secession is easy or desirable, but that the possible legal framework will be recognized. The Basque Premier backed down from holding a referendum on his “Ibarretxe Plan” for free association after threats of arrest and a negative vote in the Spanish Cortes. The reason why I argued, in this interview, that Ibarretxe should have gone ahead with the referendum is not so much that I endorsed the Plan itself (on which I am agnostic), but that I fear his backing down set an unfavorable precedent for the “right to decide,” which I do favor. 7) Nevertheless, even if Catalonia secedes, the Basque Country Autonomous Community is unlikely to follow, at least right away. Pan-Basque independentists are a powerful force and would insist on bringing along Navarre (and later the French Basque provinces). But Navarre would vote “no” in a referendum held today or at any time in the near future. No other region of Spain is likely to hold a referendum either, and thus there is likely to be no “harmful precedent” for secession or “contagion” from Catalan secession.